Reminiscences are a quite common phenomenon when it comes to cocktails. Many classics originally were created as a tribute to former recipes, but then developed own dynamics and became milestones themselves. Today’s drink is not really an example for the latter, but it is not hard at all to guess which cocktail served as an inspiration for the drink. Most likely you will already have figured it out because of the name. But the Dark & ​​Stoutly not only sounds like the Dark & ​​Stormy, it also looks quite similar. Although it must be pointed out, of course, that its namesake consists of different ingredients; at least in part. When mixing a Dark & ​​Stormy, you’ll need only rum and ginger beer (and some optional lime juice, if you like) which results in an exotic, sweet but spicy tasting cocktail. A similar flavor component can also be found inside of the Dark & ​Stoutly, where specially prepared Habanero-ginger-syrup plays the part of the ginger beer. As a person who is mainly mixing cocktails in private, syrups that need separate preparation are often more of a nuisance but some syrups can luckily be made really quick. Such a syrup is the habanero-ginger-syrup, which adds a nice fruity spiciness to the Dark & Stoutly that I personally like even a little better than I like the ginger beer in the Dark & ​​Stormy. These sweet & spicy notes are accompanied by matured rum (or even a mellow Bourbon) and, of course, by beautiful Stout as well as some lime juice. Unlike the original, fortunately no special copyright must be respected when mixing a Dark & Stoutly. The drink was invented by American bartender and entrepreneur Adam Seger who first mixed it at the San Antonio Cocktail Week. I’ve used the recipe presented and Jacob Grier’s “Cocktails on Tap”. However, the presentation is a tribute to the original: The drink is prepared by adding the stout carefully on top of a mixture of the other ingredients, so that an optical layering effect is achieved. 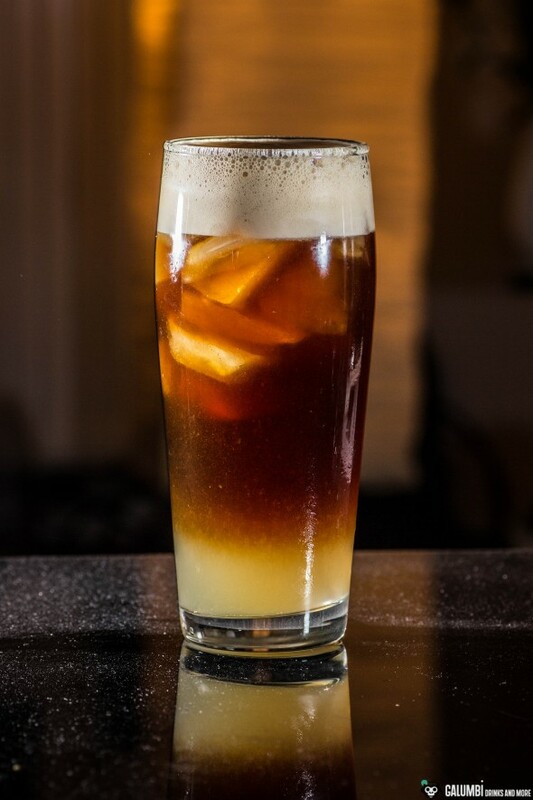 Similar to the Dark & Stormy, the drink is stirred immediately before the drinking (what of course destroys the layering effect). Habanero-ginger-syrup: Mix one halved and deseeded Habanero with about 500 ml of water, 600 g brown sugar and 450 grams of sliced ginger (leave the skin on) and let it simmer over medium heat until the sugar has dissolved. Allow to cool and strain into an airtight container. Who needs less of the syrup can adjust the amounts, it will correspondingly cool a little faster. Preparation: Shake all the ingredients except for the stout in a shaker on ice and strain into your glass filled halfway with ice cubes. Then fill up gently with the stout in order to achieve the desired layering effect. Buying sources: All ingredients should be available in well-stocked supermarkets.